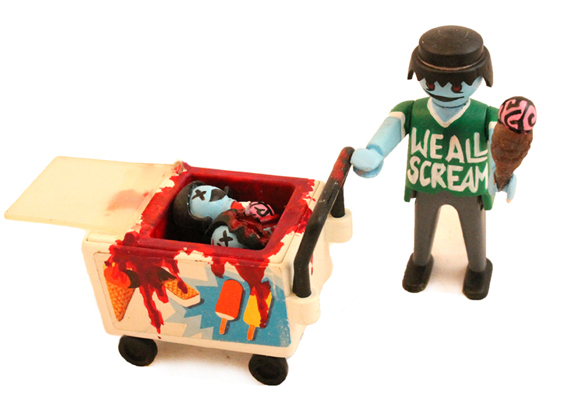 Please enjoy the following mish-mash of zombie-related items. It's bloody good reading. I grew up with Pat the Bunny, and I hope you did, too. The bunny's fluffy fur, daddy's scratchy cheek ... it's a vivid part of many people's childhoods. 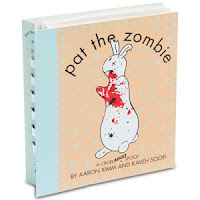 So naturally, ThinkGeek now brings us Pat the Zombie, which the website describes as a classic children’s tale turned delightfully macabre. Just be sure to keep your adult copy and your child's copy in separate spots so they don't get mixed up. In the news, an accident on the set of the new Resident Evil film led to some alarmed paramedics when they arrived on the scene and started to triage the "undead" victims. 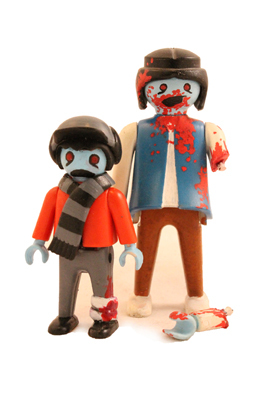 And Westlake Hardware, a chain of stores in Nebraska, is running a marketing campaign touting its Zombie Preparedness Center, which features materials to help you recover from zombie-related broken windows, trampled lawns and carpet stains, among other maladies. Both articles are well worth a read. Perverting Your Childhood with Zombies, Part II: Let's have a moment of silence for the unfortunate little people of Playmobile land. It appears they've been zombified. 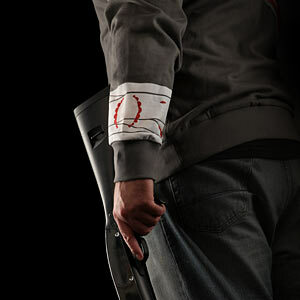 Think you're ready for the outbreak? 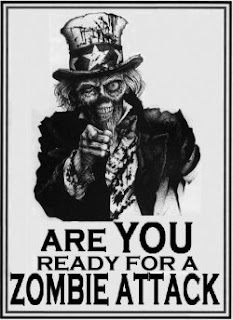 Ttest your zombie preparedness in the Run For Your Lives 5K. The course challenges runners to complete a series of obstacles ... while being chased by zombies. Those who don't find the quickest, safest route to the finish line will be zombified. The race is played like flag football. You start with a belt full of flags; if the zombies tear off all of your flags, you're turned, and you become a zombie yourself. Those who finish the race in human form will be eligible for awards. 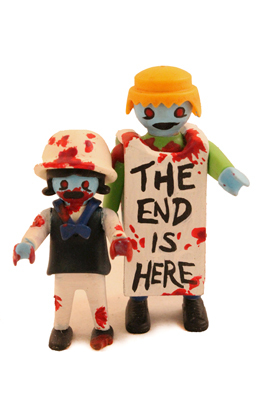 The night after the race, runners, zombies and spectators will gather at the Apocalypse Party for food, beer and entertainment. The first in a series of planned races is Saturday, Oct. 22, in Baltimore, Md. Other events are planned for 2012 in Atlanta, Austin, Boston, Indianapolis, Pittsburgh, San Diego/Los Angeles and Portland/Seattle. 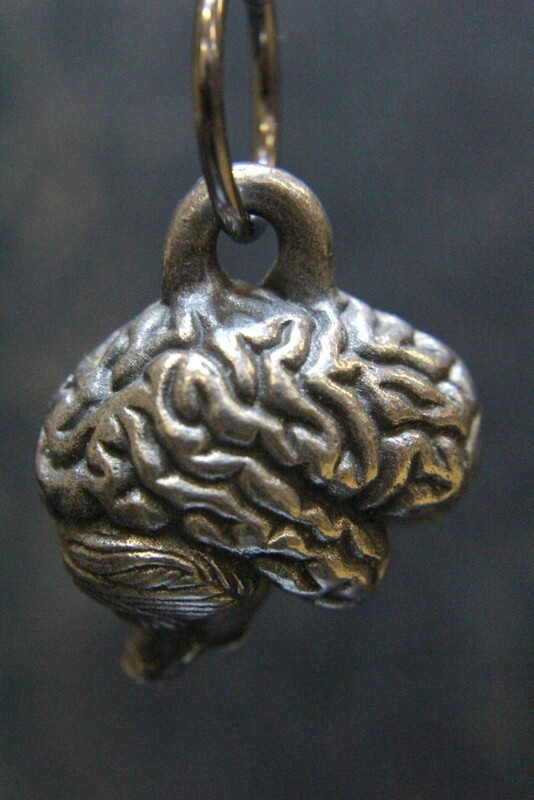 Keep a brain close to your zombie-loving heart with this pendant from Etsy seller mrd74, and store your zombie-slaying gear in this brain bag from Etsy seller bakingwithmedusa. 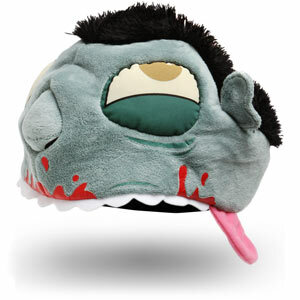 And trust ThinkGeek to take care of us with this ridiculously amazing Zombie Attack Hoodie (now sold out, but oh, how I wants it, my preciousssssss) and this Plush Zombie Hat. Jonathan Coulton's song re: Your Brains is without a doubt the best zombie song ever written. It's insanely catchy and immensely sing-along-able. 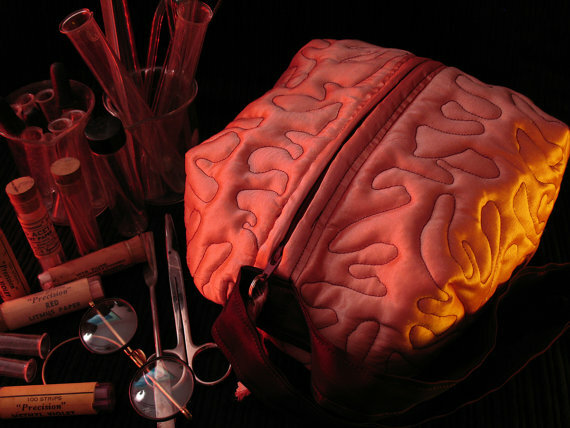 It'll work its way into your braaaaaaiiiiin. You can download the song, and Coulton also offers a karaoke version and it's available for Rock Band. I KNOW!! 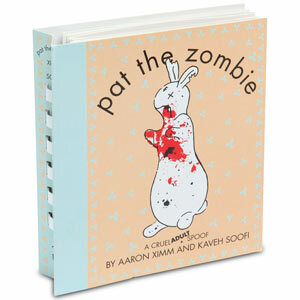 Cool stuff... you're right... zombie fans will LOVE it.